Bearanoia: Banff to the border. Lakeside reflection, or the profile of the Great Divide Route? 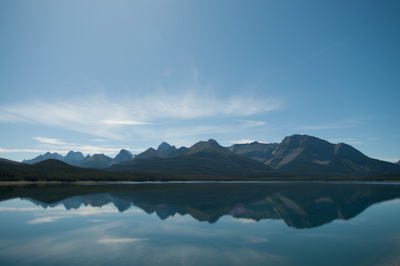 This Canadian section of the Great Divide has completely surpassed my expectations, both in its natural beauty and its sense of complete remoteness. It was harder than I’d anticipated too, thanks to a real fusion of trail styles; these first few days have covered everything from buttery smooth tarmac to flowing singletrack and loose, tyre-sucking gravel, mined with rockfests, grunty, off-the-bike pushing and even a hike and bike thrown in for good measure. All set to the zigzag backdrop of North Rockies peaks, jagged and saw toothed in profile, cupping forest and snow within their folds. 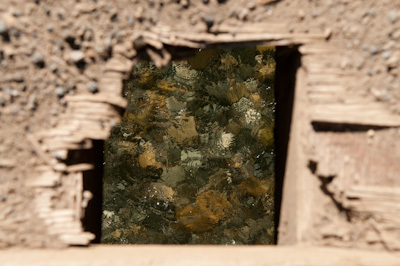 Crystal clear water through a hole in a bridge. 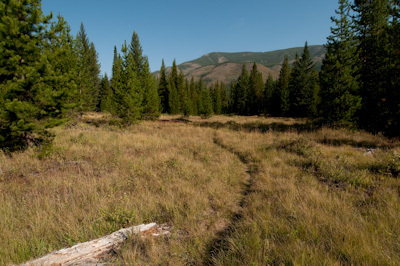 The trails may not all be idyllic and remote like this, but they sure beats hammering down a highway. 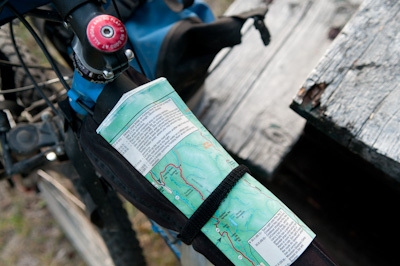 In fact, I’m not just carrying a guidebook to consult, but a whole wad of maps too – the Great Divide Mountain Bike Route is completely covered, in amazing detail, by the Adventure Bicycling Organisation. Beginning in the Northern Rockies of Banff, it wends its way down the Dividing Range, emerging finally on the dry and dusty Mexican border: via Alberta, British Columbia, Montana, Wyoming, Colorado and New Mexico. Perhaps the most remarkable aspect about it is the route keeps almost exclusively to gravel roads, forest tracks and backroads, with just a few handfulls of highway miles knitting them all together. 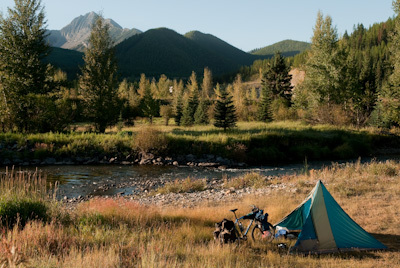 As such, it’s a real insight into quiet, backwater America; it veers well clear of major cities for its entire length of 4500kms – or 60-70 riding days. There’s also a list of navigational cues: turn right at the next forest service road (0.6 miles), or camping available by creek (3.4 miles), or tasty pies to be found in Pie Town (yes, this place really exists). Although this level of detail brings with it an aspect of riding by numbers, I’m sure I’d never have found half these trails, let alone connected them, without it. Excellent maps and cues helps unearth little-used forest back roads, where locals look incredulously as you trundle past. On departure day, Scott accompanies me to the official start point, behind the gargantuan, Scottish Baronial-themed Banff Springs Hotel, giving me one last pep talk for dealing with bears. It’s at this point, in fact, that I finally get round to snipping the safety zip tie on the bear spray can I’ve been dutifully carrying since Alaska. And he's off. All packed up and ready to roll. 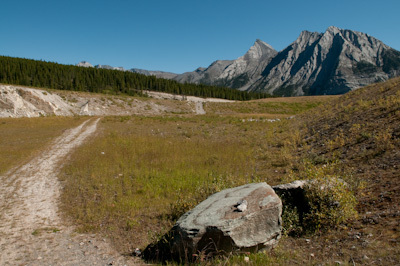 It’s exciting and daunting – but mainly exciting – to be taking to trails once more; ones that don’t waste a moment roller coasting up and down straight out of Banff, crossing crystal clear streams, and occasionally opening up into open meadows below towering walls of rock. 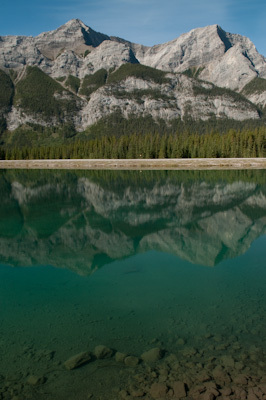 Then I skirt round one placid lake after another; they too are bathwater clear, with that same fake hint of Banff turquoise, revealing submerged bleached trees like skeletal remains, or reflecting in perfect mirror image the row of mountains before me. Mirror-like reflections you could shave in. If you weren't growing a right-of-passage beard, like me. The trail delves into thick woodland – sometimes I need to haul my bike over fallen trees – then it joins wider gravel roads, with rare but sometimes fast and dusty traffic. In places the freshly laid gravel is thick and mushy, making progress slow. The sun beats down relentlessly, and dust sticks to my tongue and gums like sherbert. The path wends its way through forest trails lit by scattered shafts of sunlight. 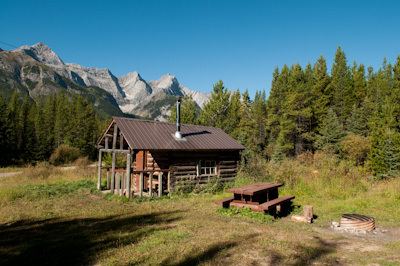 This little cabin was unlocked, and free for passing hikers and hunters. So far, I’ve been blessed with fantastic blue sky weather, though the mornings are cold, and an icy crust has begun to crackle around the tent. When I wash up in the morning in a river, my hands become fumbling claws that refuse to defrost until the first beams of easterly light strike the tent, at long last. The heart warming first beams of sunlight. 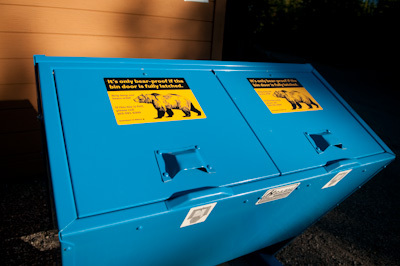 Bear Etiquette: cook well away from your tent, hang your food, and make sure your rubbish is stowed in these nifty boxes. 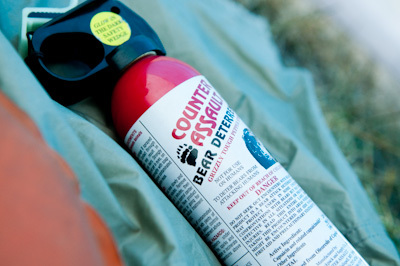 These days, a can of bear spray is my bedfellow. In fact, the place I find is not far from the mining company’s railway tracks. And sure enough, some time in the early hours, the coal train clunks by. With my head close to the earth, it sounds so extraordinarily loud it that for a moment, I think it might be bearing down upon me. When it honks, needlessly long and discordant, it’s like a church organist slumped on his keys. I peek out of my tent into the dead out of the night, and I’m rewarded with a fabulous view of a rising moon set to a cloudless sky – stars shine brightly like pin pricks of light against a jet black canvas. 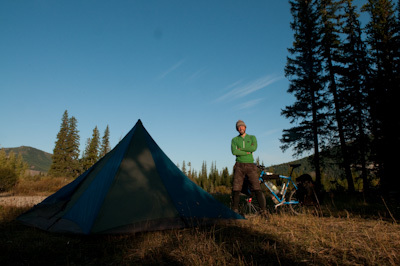 The Canadian segment of the ride is full of wild camping spots like this. The following morning, I disturb wolves, coyotes and elk in the early hours. 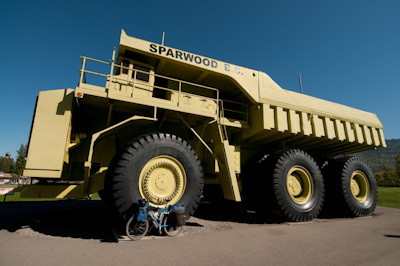 It’s a beautiful ride, and leads me to Sparwood, home to a monster truck once used in the coal mines that mole their way through these parts. I lean up my bike for a sense of scale, which looks positively Lilliputian next to it. That reminds me - I must change my tyres. 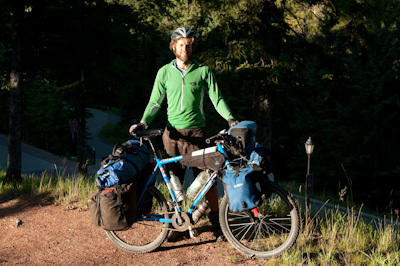 This year, a new diversion to the route avoids a busier but more direct section of highway, veering off wildly up and over a medley of passes into the Flathead Valley instead, one of the most remote parts of the entire ride. Aaron from Adventure Cycling has sent me the cues, but they look woefully incomplete compared to the notes I’ve been following. Seeking brain food – yoghurt, fruit and a box of muffins – I spend some time pondering the merits of this lengthy detour, reading and rereading through my notes, then contemplating my lack of both map and compass. Of course, in my heart I know that now I’ve thought about it, and talked about it, I’ll have to try it. But I do admit to being a touch nervous; Bearanoia, as it’s called, is itching my skin. For final reasurance, I call Aaron from the sweaty confines of a random, bashed up and fly-ridden phone box near the gates of Corbin Mine. Having ridden parts of the new diversion, he gives me the extra encouragement I need. And the route certainly is beautiful and remote. I may be late in the season and risk the fall of snow, but at least I’m enjoying the dramatic onset of autumn. A flay of colours, from a palette of burnt yellows and oranges, greets me as I break out of the first pass and descend down to the pebbly, dusty valley floor below, catching up with the last beams of sunlight as they retreat over the hills. 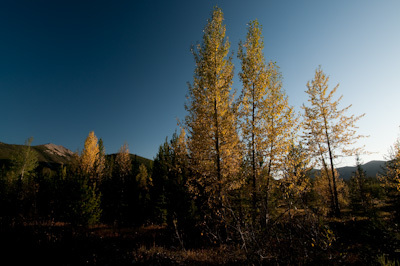 The golden glow of autumn approaches. Before long, a lone funnel of light sweeps across the valley, like a lighthouse searching for life, leaving a landscape bathed in silhouettes. I bump into Tom, who’s hunted all over the world – in as faraway places as Tajikistan and Eastern Russia. He immediately starts to fill my hands with muesli bars, chocolate, water and, somewhat randomly, even a can of oysters that he rummages around for in his truck. He recommends a spot to camp too, by the river, which turns out to be a blissful pitch with a firepit, an old, rusty chair and a solid, primitive bench. As I set up my tent and cook up food, I sing away to myself, clattering some dishes every once in a while to ward off imaginary hungry grizzly bears. Between the noise I try to create, I can hear owls coo-ing, and even an elk bugalling – the distinctive call for mates. Initially, my ears at night feel hyper sensitive, straining to decipher each crack of a twig above the flow of river water. Soon though, sleeps gets the better of me; I’ve always felt bizarrely safe in a tent, easily forgetting there’s merely a paper thin wall between me and the outside world. 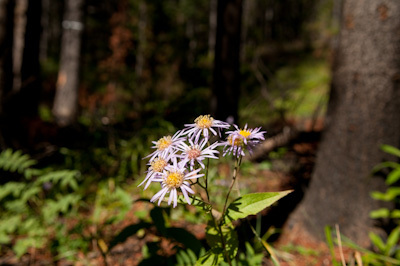 New life spurts out of the ground in areas cleared by forest fires. Keeping to my notes, I ride on, deeper into the valley. And despite the occasional encounter with hunters, the sensation is one of complete remoteness. The endless corridors of trees makes me feel suffocated at times, and I’m glad when the track breaks out into a meadow, cleared by fire or felling, and for the relief offered by its big views. I get trigger happy with my bicycle bell – ring-a-ling-a-ling – at anything that makes the merest hint of a noise around me, finger stroking the trigger button in anticipation. 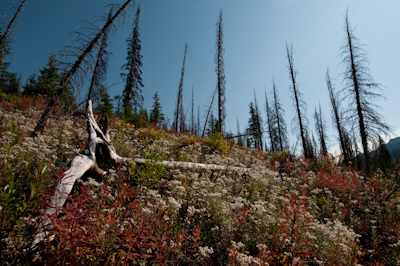 The next pass takes longer to conquer; at the top, I lose the claustrophobia of the treeline, emerging onto a gently undulating plateau, where the remnants of fire-charred, stick thin trees intermingle with new growth, and fresh flowers – bright reds and yellows and blues – and plants that push their way through the space cleared out by fire. 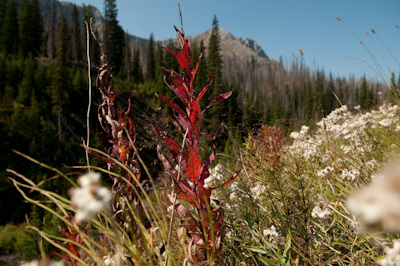 The riot of unexpected colours at Cabin Pass top. Even? Not really, I think. As far as I can see, the animals are just standing there, minding their own business, and you’re sneaking up on them with a rifle, with the intention of popping them one between the shoulder blades, skinning them , chopping them up, then lobbing their head in a cauldron. Even? Let’s just agree to disagree. Anyway… As I’m not too sure what the camping options are like further ahead, I pull over early at Wigwam creek: I wash in the icy cold waters, clean clothes and call it a day, resting in the shade. I crack open a can of tuna to go with my pasta, which is quickly gulped down. A sudden thought: can bears sniff out a single whiff of fish within the whole forest, in the same ways that sharks might detect a droplet of blood in a vast ocean? The cairn! The jigsaw comes together. 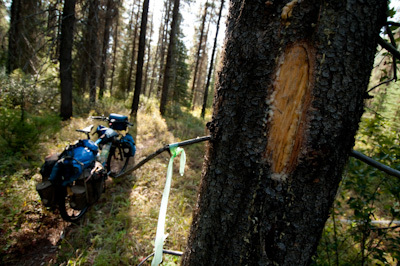 The subtle indent of singletrack that will lead me to the next forest road. Or so I hope. Following the markings trailblazed by a hunter. 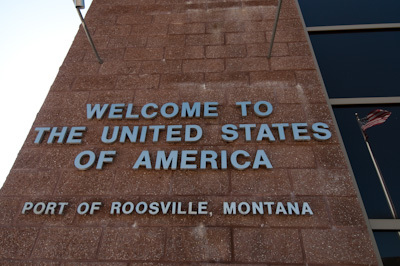 All of a sudden, it seems I’m out of tree cover and dropping fast onto a main road where trucks prowl between countries – it’s the highway that will take me to the US border in just a couple of miles. The change in scenery is astonishing. Gone are the raw peaks, replaced by softer lines, cattle ranches and a beating, oppressive heat. Sweaty and smeared with dust, I fritter away my last 14 dollars of grubby coins on nuts and candy at the lone and empty Duty Free store, digging through my pockets like some semi-feral, grimey creature. 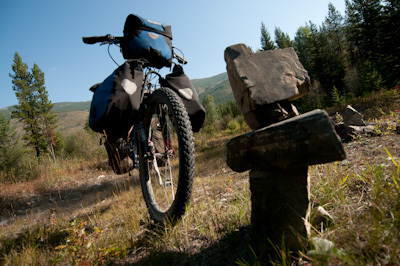 This entry was posted in BC and Alberta and tagged Banff, Elkford, Flathead Valley, Great Divide Mountain Bike Route, Sparwood on September 19, 2009 by Cass Gilbert. Gripping reading and photos….perhaps this section should be censored for parents..! that kind of nature inspires words. I can clearly see the places with your accurate language, having been there. Cass – I’m really enjoying your writing and photos. I’m picking up tips for our travels. Gem and I are going to be biking in California in December and then China in Spring. Thanks for all the advice with China – a plan is slowly forming. Pedal, pedal, eat, pedal, eat, eat pedal, pedal, pedal . . . and stay safe! Col – where in California? I might have some ideas. We’re going to be exploring the area between LA and San Francisco. On the list are: Big Sur, Yosemite and Santa Barbara. Any thoughts?! Looked like a good crowd you met – lets here it for the cruisers! I’m saving up for a Surly Karate Monkey – fixed gear commuter/29er tourer. Just need to sell a few more bike bits to fund it.